Our family likes to travel, and we travel a lot. With the warmer weather upon us, we’ll definitely be heading out a lot more. I mean we still have hints of cabin fever left over from being shut-in during this past horrible winter so we will be hitting the road as often as we can. 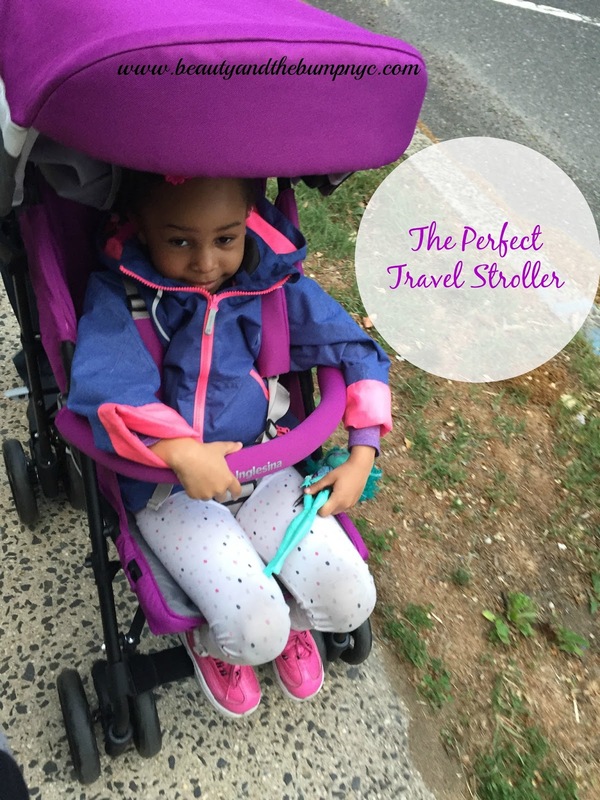 Any time we head out for trips that involve lots of walking, we bring a stroller. Most parents can agree that the worst thing to happen on a trip anywhere is a tired baby or toddler who can’t or won’t walk; it’s like carrying dead weight. Carrying around a bulky, heavy stroller really isn’t an option for us, so we sought out to find the perfect travel stroller. This is where the Inglesina Trip comes into play. The Inglesina Trip is what I’d like to describe as a tricked out umbrella stroller. It has all of the features of a full-size stroller like a padded bumper bar, rear suspension, cup holder, rain cover, peek-a-boo window on the hood, ergonomic soft-touch handles, water-repellent fabric and a decent sized storage basket. I have to be honest; I’ve been eyeing the Inglesina Swift for a long time, but unfortunately, Inglesina discontinued it. I was so happy when I was told I could test out the new Inglesina Trip in my favorite color, purple (Iris). As far as what I was looking for in a travel stroller, it had it all. The Inglesina Trip is stylish, lightweight, comfortable, and easy to maneuver. Best of all, there wasn’t much to put together once it came out of the box. Mini me loved the Inglesina Trip. When we’d go on our walks, it was the first thing she asked for, and at times, begged for. She’s fallen asleep in it, and speaking of sleep. For a travel stroller, the Inglesina Trip reclines further back than any other umbrella stroller I’ve tried; it reclines practically flat, which makes resting in it super comfortable. Another characteristic of the Trip, which makes rest bearable on a sunny, rainy, or windy day, is the large canopy. The Inglesina Trip passed my husband’s test, and mine too. The height of the handle bars were perfect for the both of us, especially since I’m at least 6” shorter than he is. We were both able to maneuver it better around curves, over grass, bumps and cracks much easier than our current stroller. Unfortunately, this is not a perfect world. There were two things about the Inglesina Trip that didn’t work for us. Although the Inglesina Trip is simple to fold and unfold the stroller using one or no-hands (a foot only), and has a lock on the side to keep the stroller folded, along with a handle to make it easy to carry around, both my husband and I did find it to be heavier than what we were looking for. The Trip is only 1.4 lbs lighter than our current stroller. Carrying around that plus, our 36 lbs. four year old would be a lot. Another thing, because our daughter is long, her legs go past the footrest even though adjusts to two positions. Overall, the Beauty and the Bump family are happy with the Inglesina Trip. 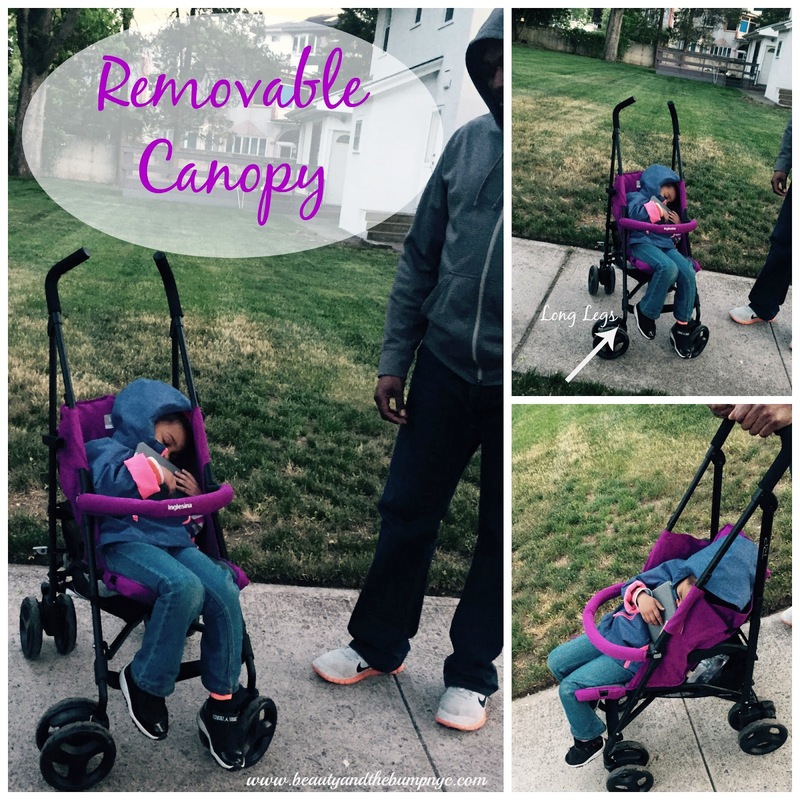 It has all of the characteristics we needed in a travel stroller. With our upcoming trip to Abu Dhabi, Dubai, and Puerto Vallarta, we’re going to need a travel stroller with a large canopy to help keep mini me shaded from the sun. Plus, the Inglesina Trip, at $199, with all of the bells and whistles included is affordable, which is much cheaper than, and has more features than the other strollers we were looking at. It’s also available in four additional colors: Marrakech (beige/blue), Luna (red), Caffe (brown), and Black. Now that you’ve read my thoughts on the Inglesina Trip travel stroller, I’d love to hear what you think. Also, is it a stroller you’d consider purchasing? Disclosure: Product provided for review consideration. All opinions are my own and are honest.